CONNECT is a multi-tool solution provider: simply activate a Tightening Unit in the CONNECT for each tool. A Tightening Unit is the eco-system of one cordless tool and all items, actions and information related to it. CONNECT-W which embeds a wireless access point and can activate up to 10 Tightening Units: it means that up to 10 cordless tools can be connected and used. CONNECT-X which requires an external wireless access point and can activate up to 20 Tightening Units: it means that up to 20 cordless tools can be connected and used. In addition, the CONNECT offers a single point of connection for communications between the factory network and up to 20 cordless tools, reducing cost of ownership and simplifying installations for easier line rebalancing. 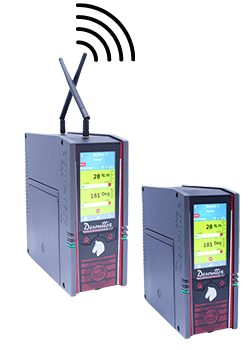 The entire family of Desoutter Wi-Fi tools are compatible with the Industrial Smart Hub and all new tools in development will also be compatible. We have designed CONNECT to be "future proof". In addition, dedicated error proofing accessories including, stack lights, socket trays, operator controls, and remote user interfaces help assure 100% reliability of the process control.